Everybody plays poker these days. It's the thing to do. It's almost become a bit too expected and a bit trendy. If you're looking for an alternative game to play with a larger group of people, Mexican poker is it. This rummy based game is easy to learn, easy to play, and can provide hours of fun for everyone. Start with the four decks of cards shuffled, and the players sitting around the table. Deal the cards to each player according to which hand you are playing (following the chart in the next section). You will be playing ten hands. Place the reminder of the undealt cards in a pile in the center of the table, and turn over the top card next to it as a discard pile. Play moves to the left beginning with the person to the left of the dealer. That person will attempt to make the first set in the series (again, refer to the chart in the next section). He or she will first take a card from the draw pile or the discard pile, attempt to make the set, and discard. When the person has made the required set, he or she will set it down, along with any other sets (three of a kind, straights, flushes) they may have. Only after laying down the required set first can they do this. Once a player has laid down the required set, he or she can play off of any other sets that anyone else has laid down. For example, if player one has a four card straight laid down, and player two has another card that will fit on either end of that straight, player two can lay that card down by itself, but only after completing the required set according to the chart. Play continues like this until someone runs out of cards, at which point all the players count their cards and figure up points. J,Q,K, and Aces are worth 20 points, 10 is worth 10 points, and 3 through 9 are worth 5 points. The 2 card is worth 40 points. Ten hands are played in this fashion, and the player with the least amount of points wins. For the first hand, deal eleven cards to each player. The second hand gets 12 cards, and so on, up until the tenth hand, where everybody gets 20 cards. No matter which hand the group is playing, a player cannot complete that hand's required set unless he or she has first completed all the sets from previous hands. 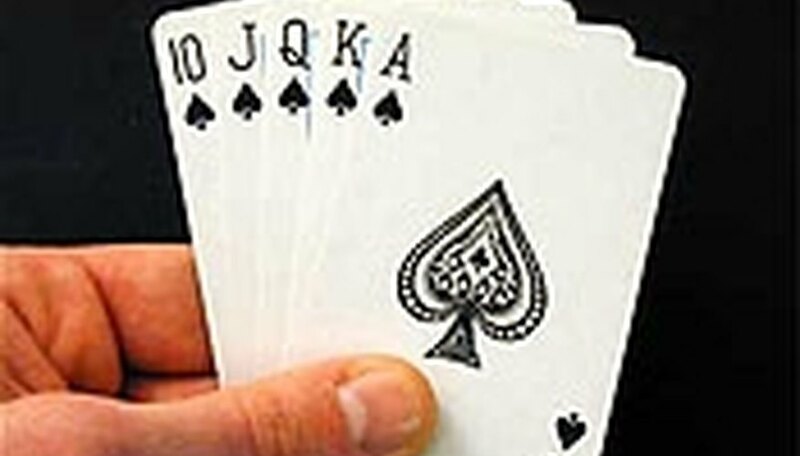 In order to successfully complete a hand, the last player must discard a card. If it is impossible to discard a card, that player will be penalized by drawing two more cards from the draw deck. To add betting to this game is very simple. Each hand has a small buy-in, and the winner of each hand doesn't have to buy into the next one. At any point, a player can 'fold' by not buying into the next hand. Of course, house rules supersede, so get creative. If you add money to this game, don't add too much. With ten hands, the pot can get pretty high. With a $1 buy-in per hand, the last hand can have as much as a $40 pot by the end of the game. Remember that unlicensed gambling is illegal in most states, though some allow for friendly small stakes games. Sandi Stritch specializes in alternative health and mental-health topics. She has more than five years experience working in a psychiatric hospital. Valentine began writing online in 2007 with pieces appearing in "The Main ARTery" and "In the Panhandle." She holds a Bachelor of Arts in psychology from Shepherd University.